Below is an excellent selection of packages of elk meat for sale on Amazon. You can usually find a large variety of meat to choose from, including steaks, ground meat, jerky, patties, meat samplers, and more. You might also like: elk hides for sale. 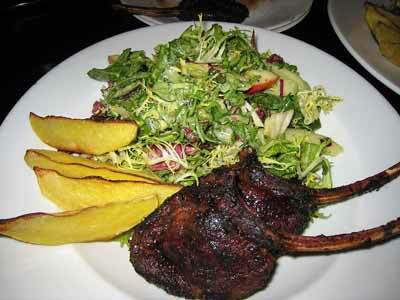 Below: Grilled elk meat, rib chops, with potatoes and salad. Image: By Neeta Lind (IMG_0089 Uploaded by Caspian blue) [CC BY 2.0 (http://creativecommons.org/licenses/by/2.0)], via Wikimedia Commons. 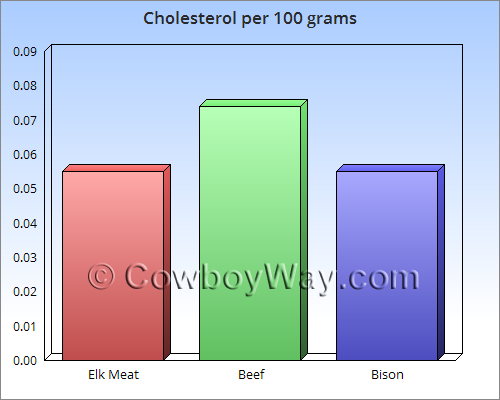 When compared to other red meats - and even skinless chicken breasts - elk meat is naturally low in calories, high in protein, and low in cholesterol. 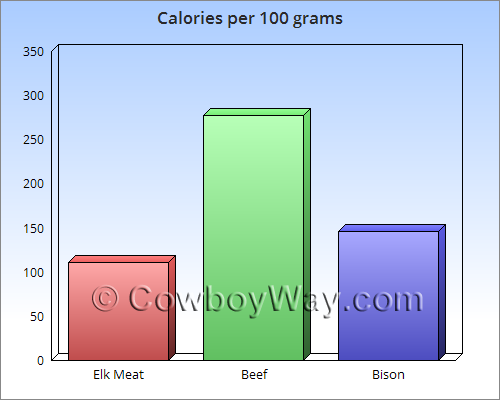 Below is some nutritional information, according to NutritionData.self.com, comparing elk meat to beef and bison. In each case the data is for 100 grams (approximately 3.5 ounces) of raw meat. Don't overcook it! Elk is a naturally lean meat and therefore cooks more quickly than other meats you may be used to, namely beef. Try cooking elk in a slow cooker, or "crock pot." Because it is low in fat, elk meat works well with slow and moist methods of cooking. 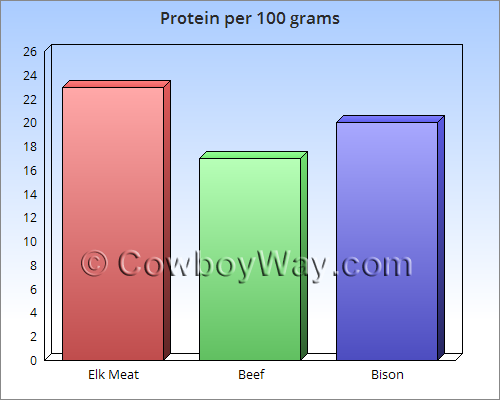 Elk meat is as versatile as beef, and can be substituted for beef in most recipes with few if any changes. However, when cooking, it is important to keep in mind that elk is naturally low in fat and will therefore probably cook faster than beef. Any overcooked meat, including elk, can become tough and lose its good flavor. Sometimes you will hear elk meat referred to as "venison," a word some people reserve just for deer meat, not elk meat. So, is elk meat the same thing as venison? Well, yes and no. For a lot of people the word "venison" refers strictly to deer meat, and although elk are related to deer they are nonetheless a distinctly different species. For other people, though, the word "venison" is a broader term that means not only deer meat, but also the meat of elk. If you find some elk meat you like but you're not ready to make a purchase right away, you can always add it to your shopping cart so it will be easy to find later. In most cases, Amazon.com will keep track items in your shopping cart for 90 days. In the meantime, if you want to check out with other items, click "Save for later" to move the standards to a separate, but still easy-to-find list beneath your shopping cart. Important: Putting elk meat or other items in your Amazon shopping cart or "Save for later" list does NOT reserve them! It just makes them easier to find if they're still in stock when you come back.